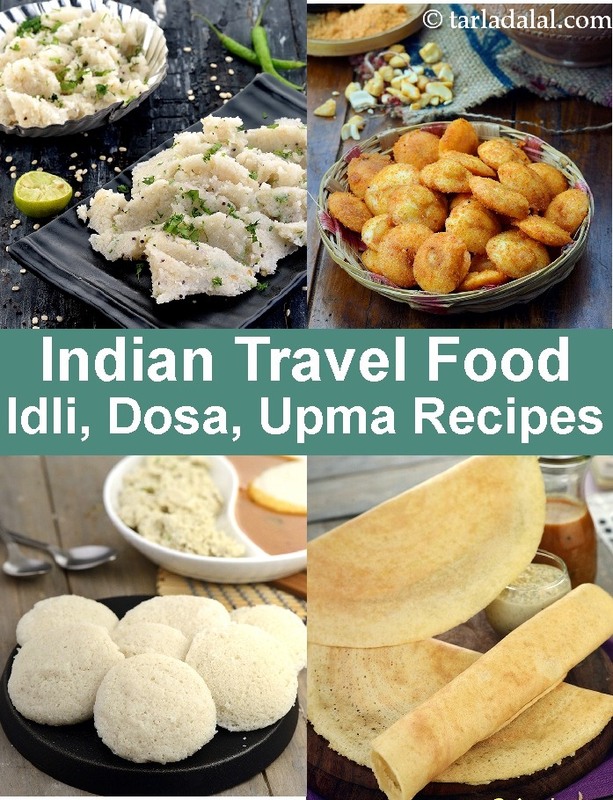 Why Idli, Dosa and Upma are excellent travel foods. Details on how to pack them! Like parathas, puris and theplas, idlis, dosas and upmas are also all-time favourite travel foods. While these used to be more popular in South India earlier, nowadays this distinction is fading as people are beginning to enjoy foods from across the country. It is common to find these foods being sold by vendors on trains as well as in railways stations in South India. Even in the remotest railway stations in South Indian, you will find vendors carrying bamboo baskets loaded with idlis wrapped in banana leaves. If you have just a few rupees on hand, you can have a wholesome meal of idlis doused in til oil and a tongue-tickling dry chutney powder called Malgapodi Powder (or malgapodi). Being a fermented and steamed food, idli is believed to be very healthy and safe. So, nobody thinks twice before buying a pack and relishing every mouthful of it! While idli is normally served with chutney and sambhar, while travelling it is customary to serve it with dry chutney powders as one does not have to worry about leakage or spoilage. Idlis is also easy to make and pack in large quantities; so many people prefer to carry it along while travelling in large parties. If you make the batter beforehand, then all you need to do is steam the idlis, let them cool, coat them with til oil and pack them. If you expect to keep the idlis for a whole day, then it is common to also apply some malgapodi on the idlis along with the til oil. As the idli soaks in the oil and the spice powder, it gets tastier by the hour! You can keep it for a day or two without worrying about spoilage. Dosa is also a good travel food. The dosas cooked with ghee, oil or butter, get a special flavour and texture as they cool, which is quite different from how they taste when hot and fresh. When preparing dosas for travel, it is important to make them slightly thicker than usual and also a little moist. If you ask elderly women in South India, they will share with you the secret of making ‘travel dosas’. You need to spread the dosa on the tava. After it cooks on one side, take very little water and sprinkle it on the dosa before turning around to cook the other side. These soft and fluffy dosas will stay good for a day or two. Allow them to cool completely, then wrap in banana leaves (or foil paper if you can’t get leaves), and store in an airtight container. Relish the dosas with dry chutney powders, or with tomato or onion pickle. You can also pack upmas while travelling but they will only be good for a day, unlike idlis and dosas that can be had almost two days. You can make tasty upmas with semolina, broken rice or poha. Be generous with the oil used while cooking so that the upma won’t become lumpy. After cooking, allow the upma to cool completely, drizzle a little oil or melted ghee if it appears dry, and break the lumps, if any, with the back of a spoon. Now, pack in your container. Since the upmas are quite tasty by themselves, tempered with spices and spruced up with ingredients like onions, tomatoes and veggies, you do not need any special accompaniment. At the most, you can take along some banana chips or dry chutney powders if you are very particular. Otherwise, you can just enjoy them plain! Try your hand at making the traditional Idli and Dosa, the spicy and famous Kanchipuram Idli, the quick and easy Upma, or other varieties of idlis, dosas and upmas featured in this collection. These are made with commonly available ingredients and flours, and are easy to make, so you can make them without sweating for too long in the kitchen. However, since most idlis and dosas require fermentation, plan ahead to make the batter. Pack these dishes with dry chutney powders and perhaps a cup of curds or buttermilk, to relish a wholesome and tasty meal on the go! 1. Allow the idlis to cool, coat them with til oil and then pack. 2. Make the dosas soft and slightly thick. Let them cool before packing. 3. Wrap the idlis and dosas preferably in banana leaves or in foil wrapper. Then store them in your containers. 4. Don’t make the upma too dry. After it cools completely, drizzle a little oil or melted ghee on the upma and break up the lumps with the back of a spoon. Then pack in an airtight container. 5. Serve these dishes with dry chutney powders like milagai podi (malgapodi) or tomato pickle and, if possible, a cup of buttermilk or curds. No, this dosa doesn’t look like a cup. It is called the crispy cup dosa, because one cup each of every ingredient is used—also making it easy to remember and repeat. A thoughtful combination of fermented dal paste and besan enables you to make this dosa thin, crispy and really golden!